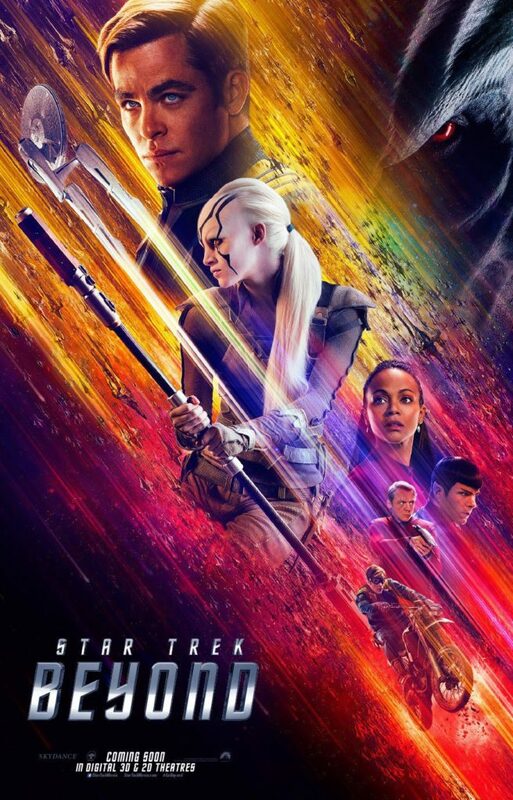 Unfortunately, like its predecessors, Star Trek Beyond struggles when it comes to giving the crew of the Enterprise a worthy adversary. Krall isn’t nearly as offensive to Trek sensibilities as Khan was in Star Trek Into Darkness, but the character is easily the weakest part of the film. At first, Krall seems to be yet another random alien warlord. He has an ideological grudge against the Federation, particularly as a peaceful coalition of diverse individuals (e pluribus unum). At one point, he tells Uhura, “Unity is not your strength. It is your weakness.” By contrast, Krall’s forces act as a hive mind, like bees, where individuality is subordinated to the group. I’m glad the film tried to give Krall deeper motivations than simply a lust for “power,” but the whole ideological conflict feels underdeveloped. Part of the problem is that we still don’t know enough about the Federation in this timeline to feel invested in its ideology (although Beyond takes important steps towards rectifying that). But, diatribes aside, Krall behaves just like any number of stock generic Hollywood villains. Krall possesses an ancient alien superweapon that somehow dissolves people (using what looks like a swarm of nanomachines). The film doesn’t bother to explain how it works. Frankly, it’s pretty ridiculous. It reminded me of the way Guardians of the Galaxy endowed a random MacGuffin (the Infinity Stone) with incredible amounts of power with no attempt at explanation (the incredibly cheesy way Kirk and crew defeat Krall also reminded me of Guardians). Apparently, Paramount wanted this Trek film to feel more like Guardians of the Galaxy, so I guess I should just be thankful that Pegg and Lin managed to limit the damage. Near the end of the film, we learn that Krall is in fact human. Balthazar M. Edison, to be precise, captain of the U.S.S. Franklin when it crash-landed on the planet. He was also a former soldier who fought in the Earth-Romulan War and had trouble adjusting to peacetime. Edison found alien technology that allowed him to extend his lifespan (again, unexplained), but ended up mutating him in the process. As Kirk reviews video logs on the Franklin, he learns that Edison sunk into despair and madness when the Federation failed to rescue him (à la Heart of Darkness). In the end, his crusade against the Federation seems more personal than ideological. I like the idea of an alien villain who questions the value of the Federation and liberal democracy (something that’s happening today with Brexit and the rise of Trump). I also like the idea of a human villain who simply can’t quite adjust to a future without conflict (part of what made Star Trek: The Undiscovered Country so great). But I don’t think both work for the same character. As Darren writes at TheM0vieBlog, the film takes “two great concepts fused together in such a way that there’s a twist between then that somehow makes them less impressive than either concept would be on its own terms.” The film doesn’t do enough to develop Krall’s ideology, and it introduces the Edison twist too late for viewers to care. It’s certainly never explained how Krall/Edison obtains such a large alien fleet and an army of followers. It comes across as a twist merely for the sake of having a twist. The Star Trek reboot seems to want to address contemporary issues of terrorism and radical violence. The villains have all been “lone wolf” types seeking vengeance against the Federation. In Star Trek, Nero lashed out at Vulcan because Spock failed to save Romulus (and his wife). In Into Darkness, John Harrison/Khan very much evoked our current fears of terrorism when he blew up a Starfleet building and crashed a ship into downtown San Francisco. Beyond isn’t as explicit in its parallels with the real world, but having Krall turn out to be human is a poignant reminder that not all threats come from the “other.” Krall’s diatribe against Federation values reminded me of President George W. Bush’s claim that al Qaeda attacked America because they “hate our freedoms” (the reality is of course much more complex). Krall’s superweapon mirrors the threat of biological or chemical WMDs. All this should make the Star Trek reboot films feel especially relevant to modern audiences. After all, Star Trek is at its best when dealing with current issues, and what’s more topical than how we respond to the threat of terrorism and lone gunmen? Unfortunately, while the reboot films appropriate some of the imagery of terrorism, they don’t do enough to engage with the ethical and policy issues. They never challenge viewers to question themselves or their government’s actions. What does it say about us that so many people agree with banning people of certain religious beliefs from the country? To what extent can or should we be using our military force overseas in order to target individuals suspected of terrorism? How do we interact with individuals or societies that do not accept Western liberalism and Enlightenment norms? These are all questions that the reboot films could address, but haven’t. In a way, these reboot films have a more difficult challenge in crafting a villain than the original Star Trek did. The Original Series was a product of the Cold War, when our primary geopolitical adversary was another nation-states, namely the Soviet Union. It was not only easier to identify the “enemy,” but also to understand the “enemy.” We could and often did negotiate directly with the Soviets on issues of common interest (including arms limitations). It was easier to accept that we were divided by different systems of government but still bound by a common humanity. This fit into Roddenberry’s Star Trek ethos. The Federation’s main adversaries were other superpowers, like the Klingons and Romulans. Some of the best Trek stories show how the Klingons and Romulans fighting for their government are no more or less evil than Kirk and his crew. By contrast, threats in the post-9/11 world are much more diffuse and chaotic (that said, we shouldn’t forget that America experienced terrorism before 9/11). Today’s threats can come from other nations, shadowy networks, or even individuals. Al Qaeda killed more Americans than the Soviet Union did throughout the entire Cold War (at least directly) with 19 hijackers, a few thousand dollars, and flying lessons. The recent shootings in Orlando and Dallas show how much a lone gunman can traumatize the nation. The threat exists at the level of the individual rather than the nation-state. To complicate matters further, the motives of terrorists and lone gunmen differ and are often complicated (did Omar Mateen attack a gay club because of his religious ideology or because he was a frustrated homosexual?). There’s a lot for Trek fans to like about Star Trek Beyond. The film. Director Justin Lin and scriptwriter Simon Pegg try hard to recapture the spirit of Star Trek. Unlike Into Darkness, which wallowed in cynicism, Beyond clearly takes place in Roddenberry’s optimistic version of the future. Starbase Yorktown is a beacon of civilization near the frontier of known space. It’s a beautiful location, filled with the promise of technological progress. The little we see of Starfleet suggests an altruistic organization dedicated to peaceful exploration. As I noted in Part 1, the Enterprise finally behave like competent professionals. But Beyond missed a big opportunity to feel relevant to 2016 in the way The Voyage Home was relevant to concerns about 1986 or The Undiscovered Country was relevant to 1991.